Vishnu Temple Press ... Grand Canyon and Colorado River books. 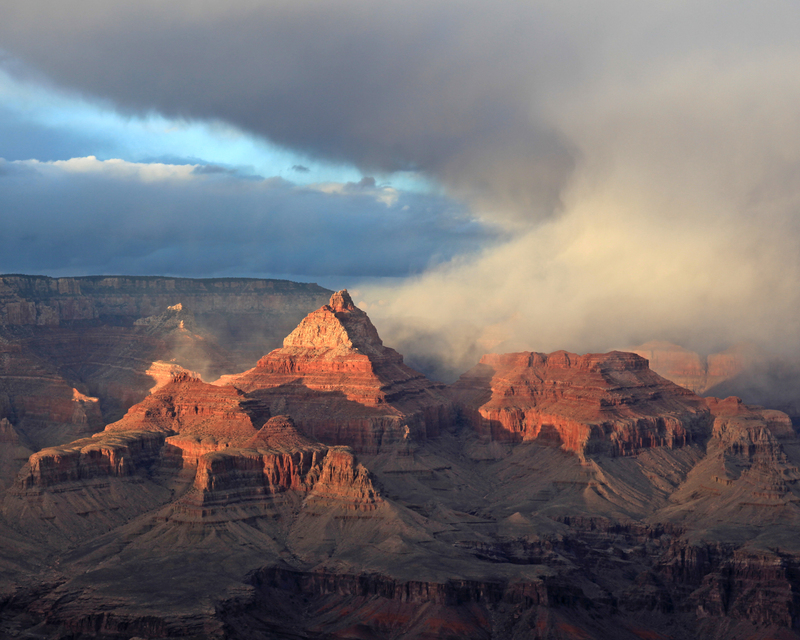 Vishnu Temple Press publishes and distributes non-fiction books about the Grand Canyon and Colorado Plateau. Sale page to order books at reduced prices. You can combine them with orders from this page too. We now accept credit card payments over the phone or you can use the PayPal buttons next to each book or mail in a check, details at the very bottom of this screen. Credit card payments are processed by PayPal. The National Park Service is made up of thousands of dedicated employees, doing hundreds of different jobs, and all working to “conserve the scenery and the natural and historic objects and the wildlife therein and to provide for the enjoyment of the same in such manner and by such means as will leave them unimpaired for the enjoyment of future generations.” Most folks, if asked who takes care of our National Parks would say – Rangers do. That’s understandable. Rangers are seen manning the gates. Rangers give the campfire talks and patrol the park. However, the reality is that rangers only make up a fraction of the Park Service’s staff. There are biologists, janitors, historians, electricians, clerks, architects, snowplow operators, purchasing agents and dozens and dozens of other professions—all working directly or indirectly to maintain and manage our National Parks. Chuck described his career as a Park Ranger in The Making of a Ranger. He finished that book as he changed direction within the NPS. He moved over to become an apprentice carpenter at the ripe old age of 37. Chuck and his fellow tradesmen maintain the homes the rangers live in. They keep up the visitor centers and the other public buildings and facilities the visitors use. Sometimes they build new things and often their work is to preserve old things. While their work is on display everywhere, they work behind the scenes. No one knows they are there, so consequently few would recognize the important, sometimes exciting, and often joyous work they do. 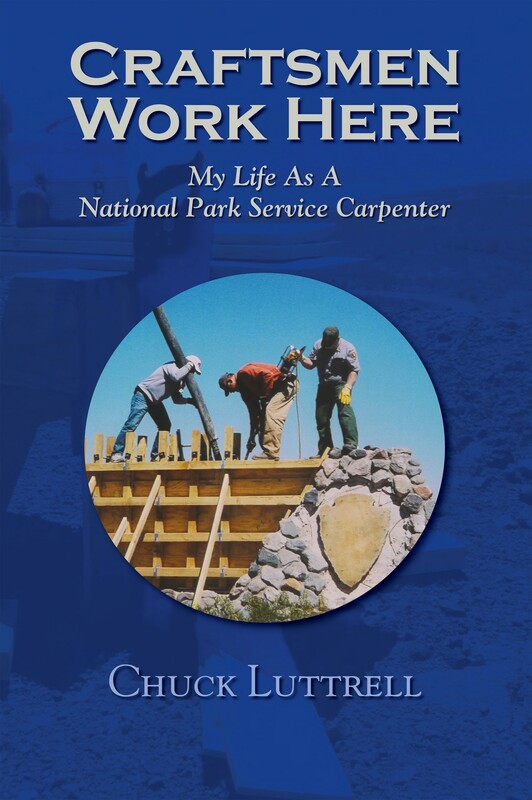 So here is a look into the life and work of a tradesman in the National Park Service. This is a story about what it is like to work in some of the most beautiful and significant places in America, on some of our nation’s finest treasures, in an organization with a noble purpose and with people that are more like family than co-workers. 978-1-7322192-3-6, 150	pages, 6" wide x 9" high, B&W photographs and maps, May 2019, $15	.95. Duwain Whitis and Tom Martin have teamed up again to write and design a new Arkansas Rivermap, Guide to the Arkansas River, Colorado. 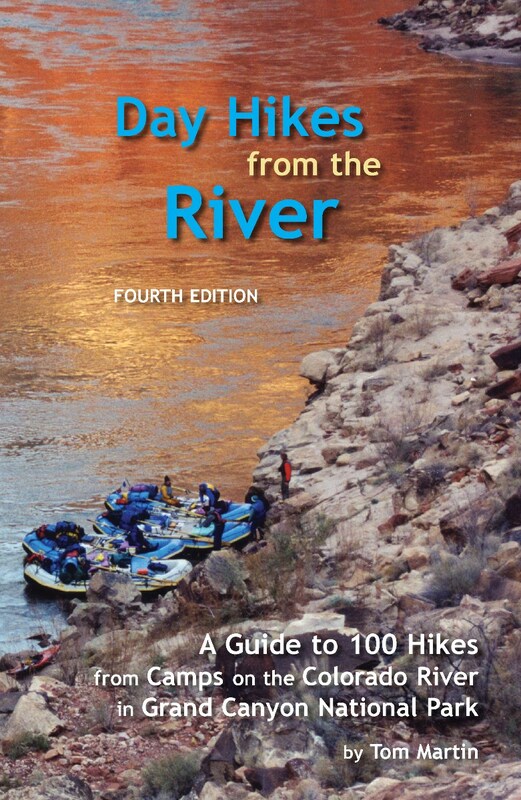 This guide covers the Arkansas River beginning at Hayden Meadows above Granite and covers the 115 miles of river from there to Cañon City. River sections include Pine Creek, Numbers, Fractions, Milk Run, Browns Canyon, Stone Bridge to Rincon, Rincon to Pinnacle Rock, Parkdale and Royal Gorge. 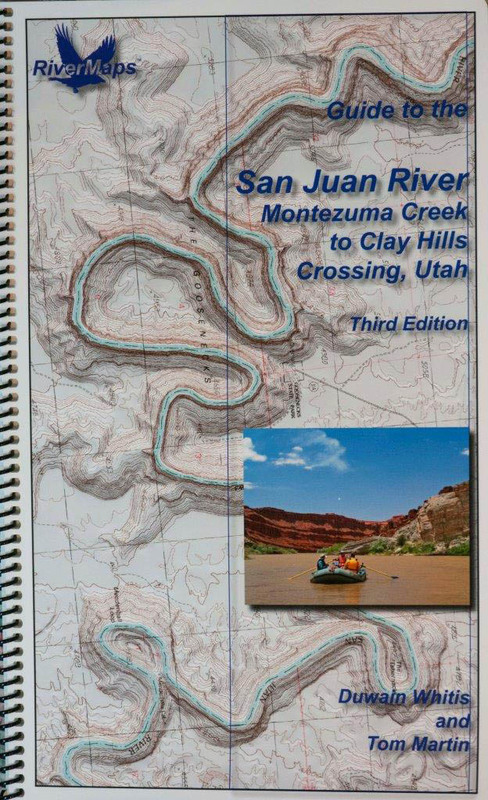 This guide is the same format as the guides to the Grand Canyon, San Juan River, and Canyonlands by Duwain and Tom. The Arkansas Guide includes lots of useful information about rapids, including where to scout the rapids if scouting is indicated. Campsite information is also included, as well as wildlife, historical and geological information. The guide contains great color photographs,and the 7.5 minute USGS quad-maps "going-with-the-flow" layout from the bottom of the page to the top of the page helps you locate where you are when on the river. The guide has 62 pages, spiral bound 8.5" x 14" mapbook printed on waterproof tear-resistant plastic paper. 978-1-7324017-1-6, 62 pages, 8.5" wide x 14" high, March 2019, $29.95. Verde River Elegy tells the story of the author’s epic canoe journey from the Verde River headwaters to its end at the Salt River, the longest known continuous boat trip on the river. The Verde River’s precious ribbon of green is a 196-mile oasis of riverside forests, stunning canyons, diverse wildlife, and cool water in the searing Arizona heat. In addition to the spectacular scenery, Jon also encountered flow-depleting diversion dams, river-choking invasive plants, threatening hillbillies and hat-stealing trees. Jon paddled alone through tranquil pools and splashy rapids along this beautiful oasis, with only his trusty canoe Red for company, a laminated river map to show the way, and a notebook in which to record the journey. From that notebook, Verde River Elegy was born. 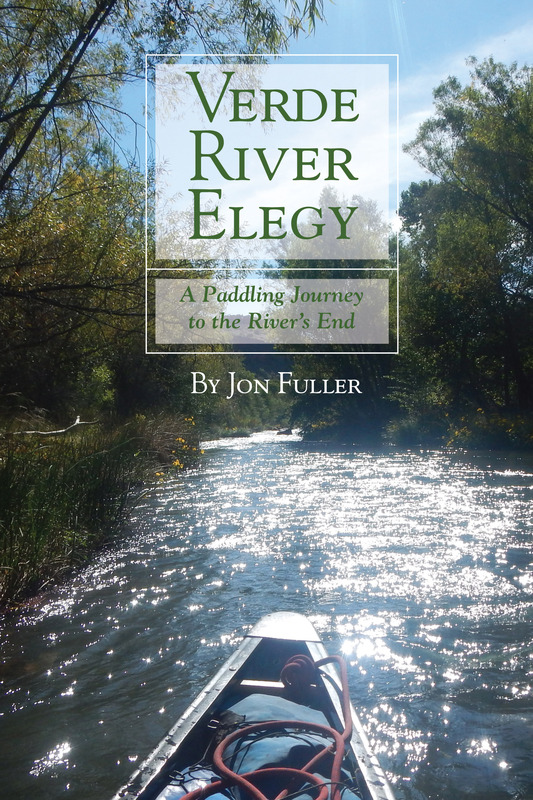 Jon’s writing is at times humorous, always reflective, and ultimately poignant, as development threatens the river’s very existence. He took this trip to say farewell to the shining emerald that is the Verde River before it is gone forever. Jon Fuller’s fascination with rivers began in early childhood, spending hours floating sticks in a creek and pretending they were boats. He paddled his first real boat at age five. At age twelve he took his first multi-day, unsupervised canoe trip. Jon’s love of rivers took him to graduate school in Arizona, where he studied the flood histories of the Salt and Verde rivers. There, the subtle magic of rivers in the desert captured him, and he made Arizona his home. Over his 34-year career as a well-known hydrologist and geomorphologist, he authored hundreds of reports about rivers throughout the West. Jon worked and played on the Verde River throughout his career, and has witnessed firsthand the river’s steady decline. This is his first book. 978-1-73221-92-1-2, 272 pages, 6" wide x 9" high, 150+ color photographs and maps, September 2018, $24.95. River Runners come from all walks of life, all ages, all backgrounds. Their reasons for taking to the water are as varied as they are, yet many recurring themes run through their stories. This anthology presents a picture of those commonalities, weaving tales of adventure and growth with retrospectives on memories and connections. We’ve gathered stories from 32 authors around North America to share why they boat so anyone who has been soothed by the sound of running water, longed to travel a wilderness river to escape modern life and bond with friends, or been thrilled by explosions of whitewater will find a story here that will ring true and speak to them. Bev Kurtz is a Coloradan who has been running rivers since the mid 1980s when she worked as an archeologist in Grand Junction, Colorado. Follow on careers as a middle school teacher and then a project manager at IBM allowed her time off to pursue her passion for rivers. Now retired, she spends much of her energy fighting dams, traveling, writing, and playing in the out of doors with her husband, Tim, and her river tribe. 978-1-7322192-0-5, 256 pages, 6" wide x 9" high, July 2018, $17.95. This is Patricia McCairen's chronicle of her 25-day solo raft trip through the Grand Canyon. With grace and insight she records a lyrical tale of personal discovery, where the river and life merge, where rapids are a metaphor for life's challenges. We are pleased to be a distributor of this classic book. Our stock is from the original print run in 1998 so the covers are slightly scuffed. However they are new books, unread and perfect inside. 978-1-58005-007-4, 248 pages, 5" wide x 8" high, 1998, $16.95. 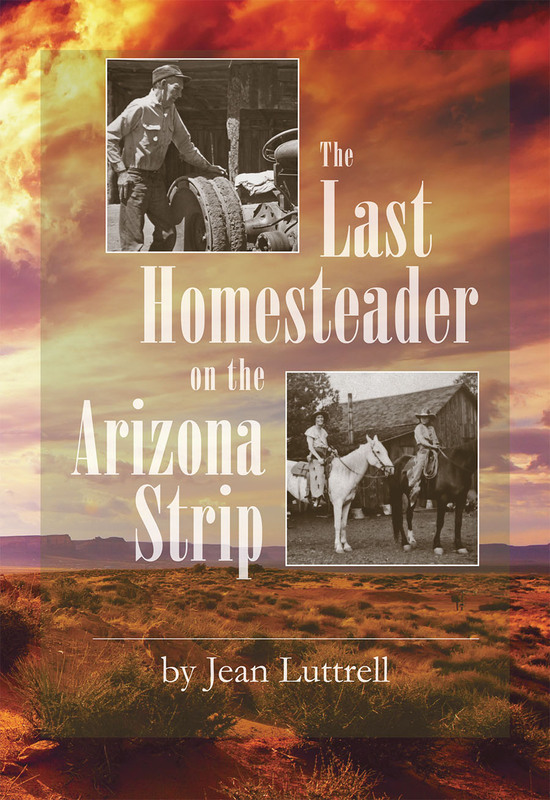 "The great Arizona Strip adventure began with a decision by my father, 32-year-old Al Craig, to seek land to homestead. Al was bored, restless, and tired of being the owner/operator of the Pacific Garage in Redondo Beach, California. Responding to a news article that said veterans could apply their service time to the homestead requirement and also to his deep-seated need for adventure, Al left Redondo Beach on a crisp September morning in the year 1927. With bedroll, chuck box, plus gas and water barrels stowed in the back seat of a Chrysler taxi cab, which he had received as payment for the cab company’s past due gas bill, he set off on a journey of more than 1,000 miles. Thus began the Arizona Strip adventure—an adventure that lasted more than 40 years." Jean Luttrell is the author of John H. Riffey The Last Old-Time Ranger. Riffey was great friends with her father, Al Craig, and we had long hoped she would share her memories with us of growing up on the Arizona Strip as the daughter and grand-daughter of homesteaders near Mt. Trumbull beginning in the 1930s. Her story is of hopes and hardships, rodeos, fires, blizzards and droughts, hard work and the neverending search for water. Al was driving out there before the CCC built the dirt roads we still use to access this stark but fascinating land. Their neighbors were welcoming and supportive but were not living within hailing distance. Only the hardiest and most determined stayed. 978-0-9905270-9-1, 240 pages, b&w photographs, 6" wide x 9" high, March 2018, $17.95. 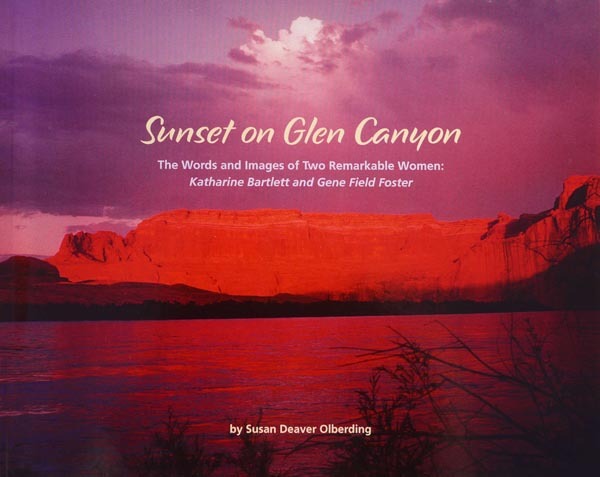 Gene Field Foster, photographer and artist, was committed to preserving Glen Canyon's memory through scenic and scientific images. Her passion manifested itself in over 500 exquisite, irreplaceable, little-known photographs now in the Museum of Northern Arizona (MNA) archives. 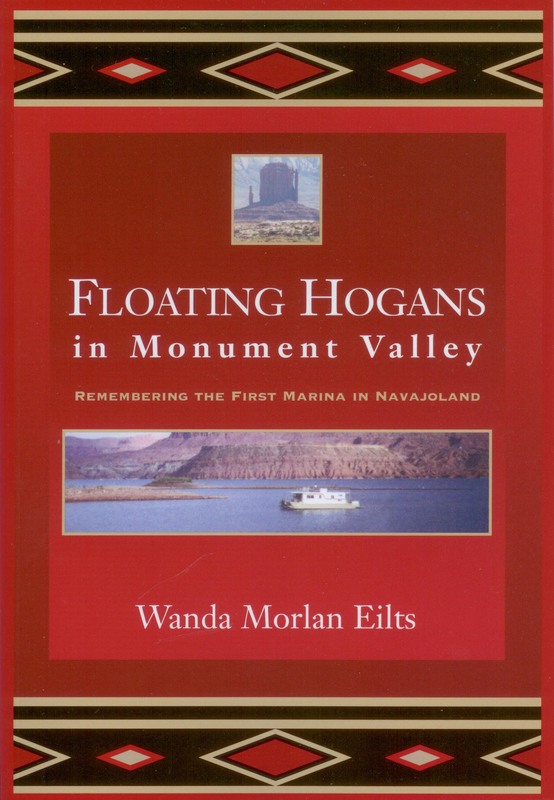 Her friendship with MNA Curator of History and Librarian Katherine Bartlett led to them leading survey trips to explore, map, and photograph archaeological sites in Glen Canyon up to the projected level of Lake Powell. This is a slim book with many remarkable photographs. We've chosen to distribute it because Glen Canyon is the place we can almost visit but not quite. It disappeared beneath Lake Powell when Glen Canyon Dam was built. We can hike around the edges, and it has a lot of edges to it. We can float over it and see its contours and potential as a river, but the only way to know it now is through the several stunning collections of old photographs and journals scattered around the archives of the Southwest. This is a sample from one of those and we thank Susan Deaver Olberding for making it available to us all. 978-0-9720048-3-1, 52 pages, color photographs throughout, 2011, 9" wide by 8" high, $19.95. See Reviews Animal stories have wide appeal, and most people have a few tales of their own to tell. Here Nancy shares a unique perspective drawn from a lifetime of living in national parks with her ranger husband, in addition to her travels to wilderness areas all over the planet. Come along on these intimate discoveries and reflections immersed in their landscapes. Nancy Rivest Green describes her personal encounters with wildlife in nature, and presents scientific research on each creature for greater understanding. Wilderness is also a character in these stories of top-tier species-some of which are sliding toward the brink of extinction. This book offers the reader a delightful collection of first-hand wildlife encounters. 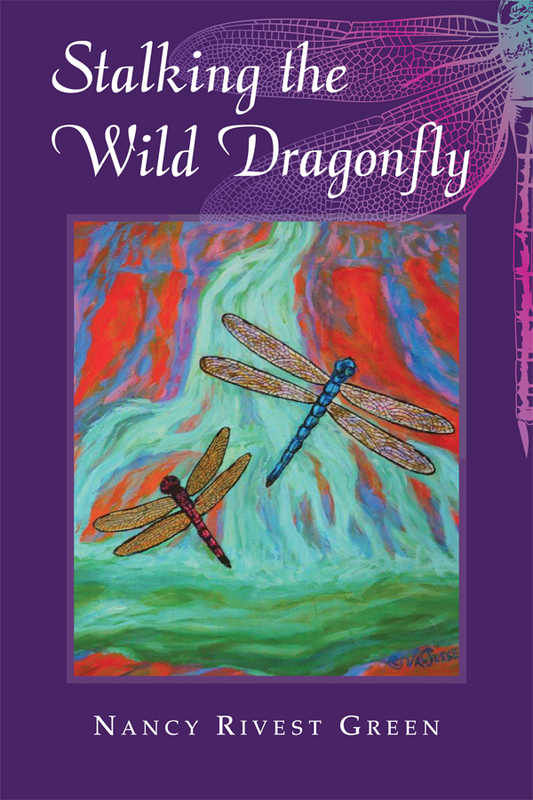 Nancy Rivest Green has lived in the lap of wilderness for years and has traveled to fascinating places where wildlife was the main attraction. Add wonderful descriptive writing to such settings and experiences and suddenly you find yourself right in the middle of hunorous, and sometimes frightening, encounters with a diverse array of creatures. Each story of a personal encounter is followed by facts about that particular animal, which makes the book both fun and educational. I thoroughly enjoyed the entire experience; and I now have a strong urge to book a trip to some exotic place where animals abound. Treat yourself to a good read. -- Bonny R. Carney, Ph.D., author of Living Large in the Land of the Incas and Honking Your Way Toward Enlightenment. Valjesse O'Feeney's art adds immensely to the charm of this book. It's a lovely gift for anyone who loves being in nature. 978-0-9905270-5-3, 160 pages, 47 b&w sketches by Valjesse O'Feeney, December 2016, $15.95. 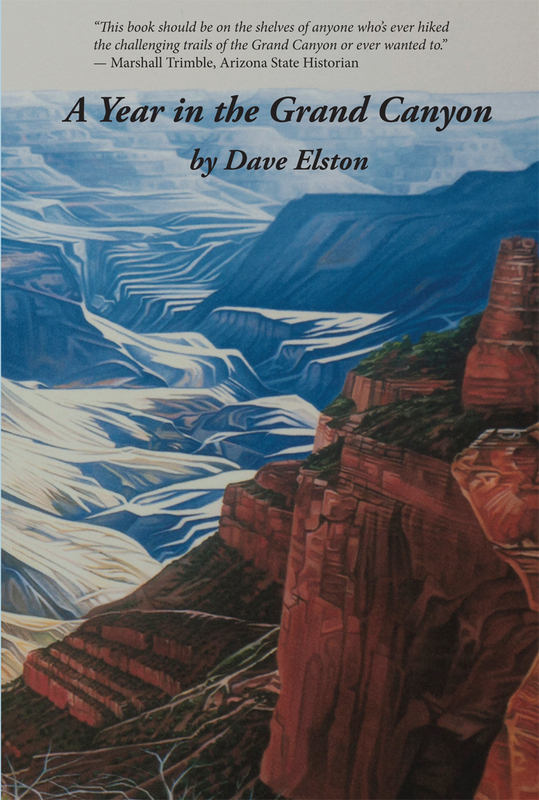 "Dave Elston’s passion for spending time in the beautiful Grand Canyon wilderness has produced a series of riveting stories that makes it a must read for anyone who’s ever been bitten by the “Canyon Bug.” His quest to spend 400 days in “Nature’s Grandest Architectural Masterpiece” over a period of years turned him from a green novice into an experienced veteran. Elston’s stories also provide many important lessons in survival. Nature can be very unforgiving. The vicissitudes of the wilderness including the capricious elements, ankle-twisting terrain, a lack of preparation, not understanding one’s limitations and a myriad of others have endangered or cost the lives of many who fail to give it proper respect. Dave Elston didn't let finding a dead body on each of his first two hikes in the Grand Canyon stop him coming back. Thankfully, he hasn't found any more, just lots of beauty in nature. His enthusiasm for hiking and backpacking the Grand Canyon and sharing it with his family and friends shows in his writing. 978-0-990-5270-8-4, 136 pages, b&w photographs, August 2016, $15.95. ebook $9.99. See Reviews From the air it is obvious how The Ridges Sanctuary got its name. It consists of thirty ridges, which are topped by a wide variety of trees and flora. On the sandy surface of the ridges, there are many beautiful and, in some cases, rare wildflowers. Between these ridges are swales, filled with a variety of grasses, sedges, flowering plants, and water. These ridges were created by wave activity and dune formation along former shorelines of Lake Michigan as lake levels fluctuated over the past 1,400 years. A micro-climate, created by the cool waters of Lake Michigan, has allowed plants typical of boreal forests farther north to continue to thrive here. As a result, The Ridges Sanctuary supports a unique community of nearly 500 different plants. It is the most diverse ecological system in the State of Wisconsin. Doug Sherman is a geologist and photographer. Now resident in Arizona but he has traveled widely and photographed minutely. 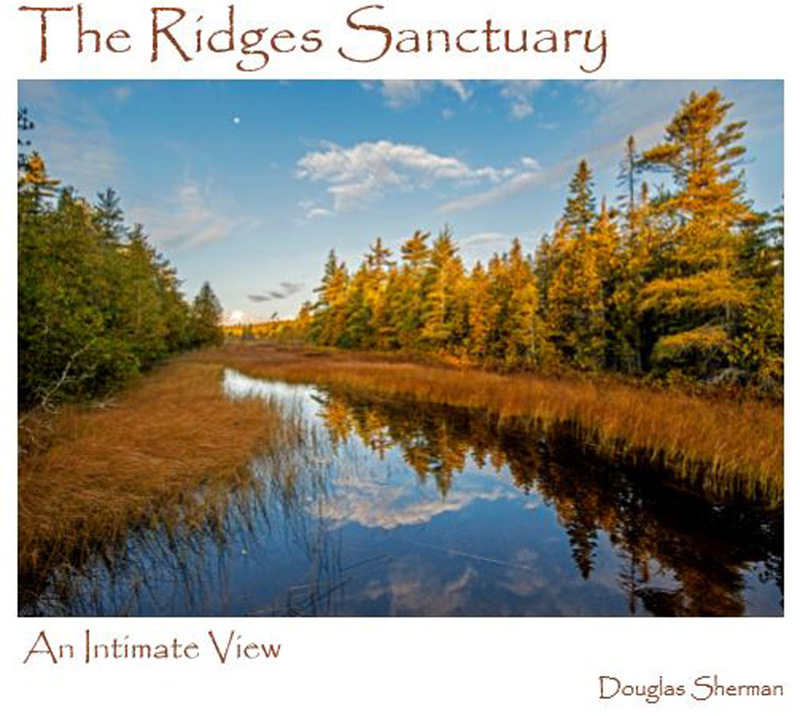 His photographs and descriptions of the rare and beautiful flowers of the Ridges Sanctuary will tempt even the most ardent Grand Canyon lover to look further afield. We couldn't resist the opportunity to publish his book. 978-0-990-5270-6-0, 108 pages, 100+ color photographs, July 2016, $32.00. See sample page A fascinating study of everyone who is known to be buried at the Grand Canyon. There are two cemeteries, one at Lees Ferry and one at the South Rim. However, many people are buried elsewhere. Most of those interred were people who lived and worked at the Grand Canyon. The early railroad builders were usually Hispanic and many current residents are too. Many were military veterans, the South Rim cemetery entrance was built by the local American Legion post. There are Harvey Girls, Native Americans, early pioneers like John Hance and William Bass, National Park Service personnel, and their families. There are over 130 black and white photographs. Some are of people living their lives at the Canyon, in their jobs, with their friends and families. Others are of the wide variety of graves and their markers. There have been people living and dying at the Grand Canyon for over a hundred years. Of course they did the same before that, but there are no written records unfortunately. 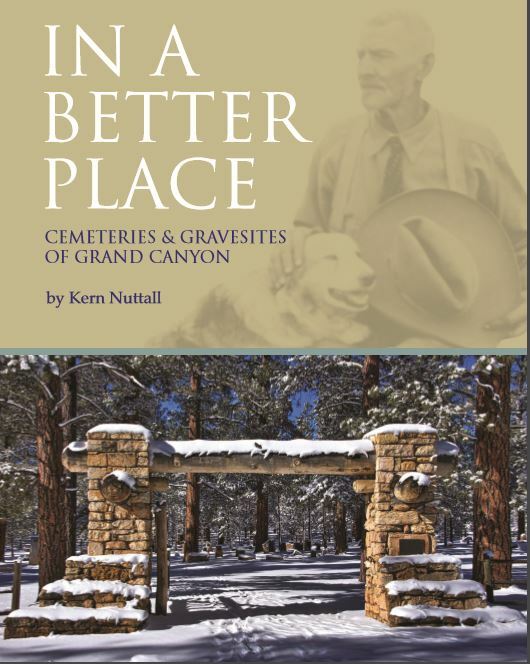 Kern Nuttall has sifted through as many death certificates and other records as he could find and talked to several of the long-time residents from the Canyon to provide a very interesting perspective on the people who keep the infrastructure of the Grand Canyon National Park running. 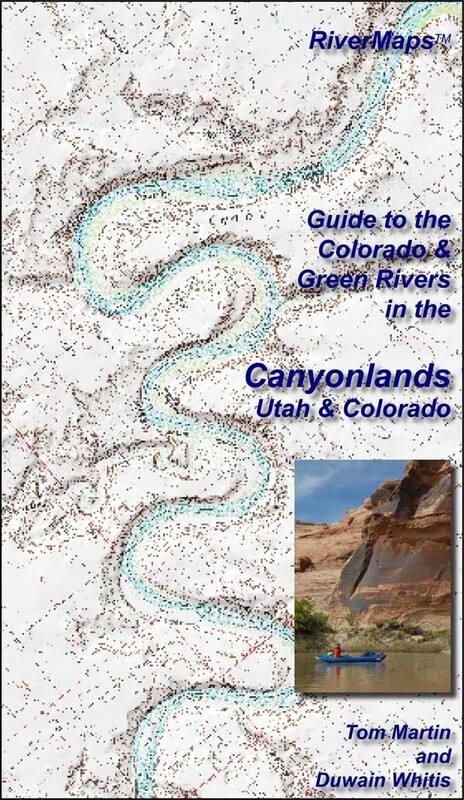 See sample page The Canyonlands RiverMap covers the beauty of Ruby Horsethief and the whitewater of Westwater canyons, all the way past the Moab Daily, through Meander Canyon to the confluence with the Green. The guide also covers the stretch from Green River, Utah, through Labyrinth and Stillwater canyons to the confluence with the Colorado. From there, these two rivers combine and head into Cataract Canyon. So does the guide, on down through Cataract and Narrow canyons to Hite, with the take-out at North Wash these days of low water in Lake Powell. Lots of useful information about rapids, where to scout the rapids if scouting is indicated, campsites, historical and geological information, hiking beta, great color photographs and the 7.5 minute USGS quad-maps "going-with-the-flow" from the bottom of the page to the top to help you orientate yourself on your next trip though Canyonlands by river. There's a robust front end section with information on how to get all the various permits and sort out shuttles. 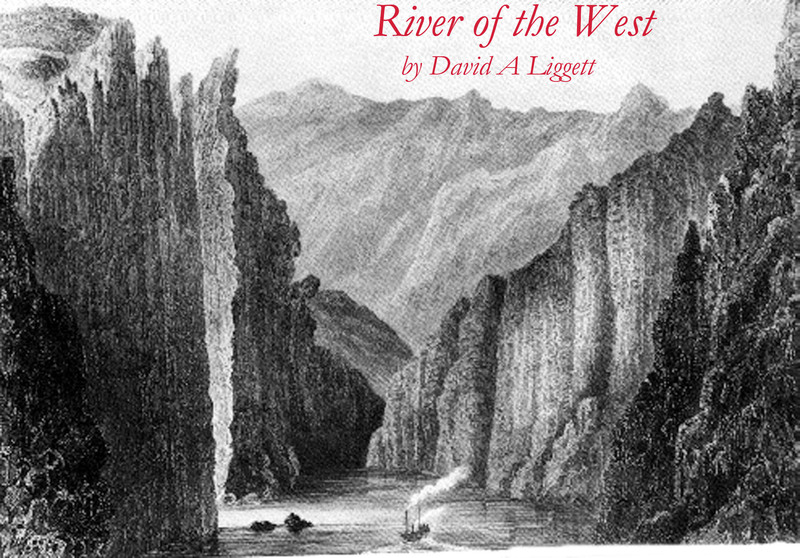 David Liggett graphically recounts the struggles and triumphs of exploring the Colorado River from the Sea of Cortez to the head of Navigation in the 1850s by Joseph Christmas Ives and George Alonzo Johnson. 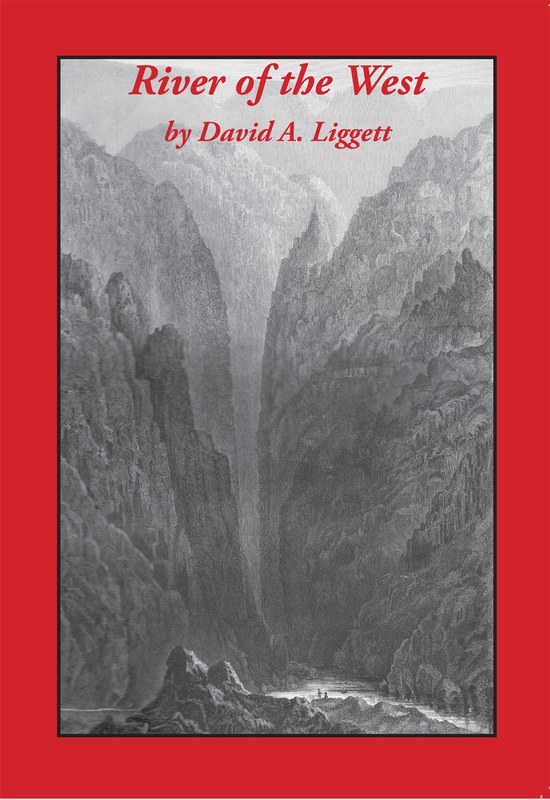 Basing his novel on journals, newspaper accounts and reports of the time, Liggett broadens our appreciation of the characters involved including the resident Native Americans and Hispanics in the development of commerce, resource extraction and emigration to California. Ebook version 2015, $9.99 as an Amazon kindle book. Please contact us for access to the book on other platforms. Click to see a sample of the map The cemetery at the Grand Canyon is located just west of the Shrine of the Ages. It contains the remains of about three hundred people, most of whom were lucky enough to live at the Grand Canyon, but unlucky enough to die there too. Cindy Stafford has put together an informative map with descriptions of a selection of individuals that anyone can stroll around the cemetery to find. There are some of the original pioners at the Canyon, including the first person believed to be buried in the cemetery, John Hance. The Harvey Girls are represented by some of those that lived there a long time as well as some who had barely arrived. The National Park Service is represented by superintendents, naturalists and trail crew. Various artists and scholars are identified. There are also many pillars of the community and rascals who made their home at the South Rim. The map leads you to the "inhabitants" described and, on the way, you'll find many other headstones of long-dead and recently departed residents. Isbn 978-0-9905270-4-6, 18" x 24" folded map, May 2015, $3.99. This will just take six months ...or so Dock Marston thought in 1947 when he began to write a simple review of the earliest expeditions along the Colorado River. He soon realized what had been previously written was woefully incorrect and incomplete. Marston resolved to compile as thorough a recounting of the first 100 river runners through the Grand Canyon as he possibly could. Dock began his history of river running on the Colorado River in Grand Canyon at a time when many of the pioneering river runners from the late 1800s and early 1900s were still alive. Over the next thirty years, Dock amassed a huge collection of first-person accounts of these river runners, from James White on a log raft in 1867 to the first powerboat runs of 1949 through 1951. This book is his opus magnum, establishing an accurate narration of these sometimes contradicting recollections. The work was almost completed in 1979 when Dock ran his last rapid. Restrictions placed on the manuscript expired in 2012, and this incredibly rich story has finally made it into book form. 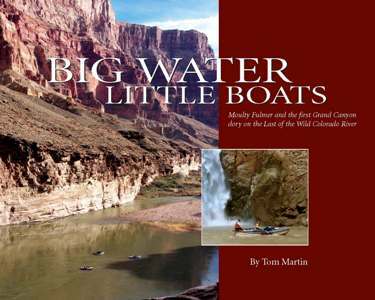 Tom Martin, author of several Grand Canyon books, brings Marston’s work to the forefront of Grand Canyon river running literature. About the author: Dock Marston ran rivers throughout the West from the 1940s to the 1970s. He ran his last rapid in 1979. He ran on some of the lowest and highest flows on the Colorado River in Grand Canyon. He also ran many types of watercraft from a one-man Sportyak, through sadiron cataract boats, dories, rubber rafts, and a variety of power boats. His collection of river materials at the Huntingdon Library is highly valued by all Grand Canyon river buffs. About the editor: Tom Martin has been hiking in and rafting through the Grand Canyon since 1971. 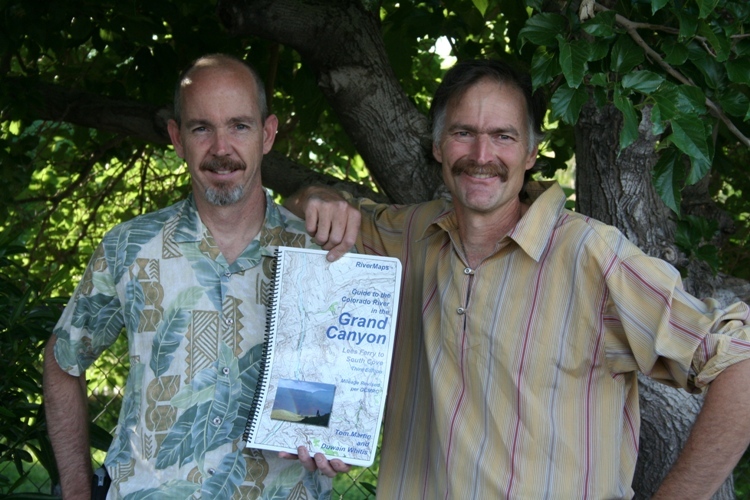 With Duwain Whitis, he co-authored the Guide to the Colorado River through the Grand Canyon. He also wrote Day Hikes from the River and Big Water, Little Boats. All three books are available from this site. Isbn 978-0-9905270-2-2, perfectbound trade paperback, 532 pages, December 2014, $30.00. See Reviews •	Bob Bordasch gives the anatomy of how not to hike the canyon, in his tale of a sun-blasted misadventure on the Deer Creek Trail. •	Ranger Kristi Rugg recounts a soulful midnight hike in high summer up the South Kaibab, when exhaustion gives way to renewal. •	D.J. Lee relates how a daughter and father see each other most clearly in a pivotal moment of shared danger on the Beamer Trail. •	On a leisurely rim-to-rim-to-rim hike one fall, Molly Hollenbach attains deep insight into the inscrutable Vishnu Schist. •	Twenty-three days into his long walk, Rick Dean is fully attuned to rock and river, crickets and scorpions, and other humans he encounters on the way. 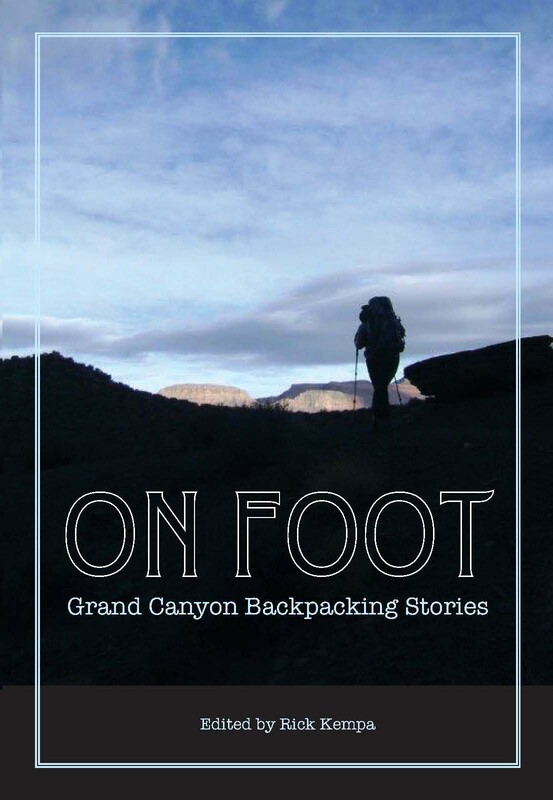 These are just six of the twenty-seven tales of adventure, discovery, danger, and deep solitude that await readers of this first-ever anthology of essays devoted to the Grand Canyon backpacking experience. In it, novice canyon hikers express their wide-eyed wonder, while veteran canyoneers reflect on how their lifelong relationship with the place has shaped their character and outlook. Rangers, trail crew workers, scientists, and trail guides weigh in with their unique perspectives. Whether they are writing from the corridor trails, the backcountry trails, or the vast canyon wilderness, these writers offer authentic, close-up views of what it is like to be afoot on particular days in particular places beneath the rim. 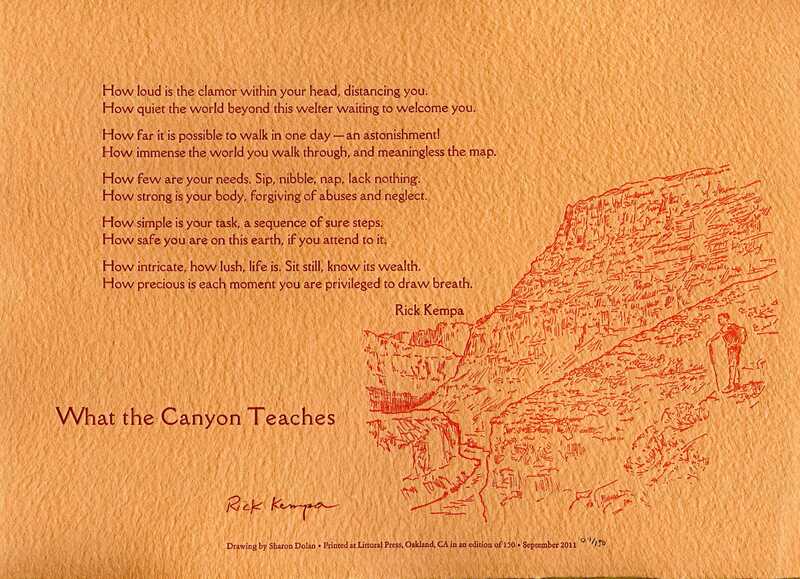 About the editor: Poet and essayist Rick Kempa has been hiking in and writing about the Grand Canyon since 1974. With Peter Anderson, he co-edited the anthology Poetry of the Grand Canyon (Lithic Press 2015). He has also authored two books of poems, Keeping the Quiet and Ten Thousand Voices. Isbn 978-0-9905270-1-5, perfectbound trade paperback, 256 pages, September 2014 $16.95. 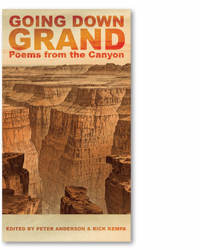 Published by Lithic Press, Going Down Grand is an anthology of Grand Canyon poetry, gathering the voices of cowboys, explorers, river runners, hikers, artists, geologists, rangers and others, whose words bear witness to this complex and magnificent place. For readers on the river, the trails, the rim, or beyond, the poems on these pages will make fine canyon company. Isbn 978-0-9883846-5-1, perfectbound trade paperback, 144 pages, August 2015 $17. 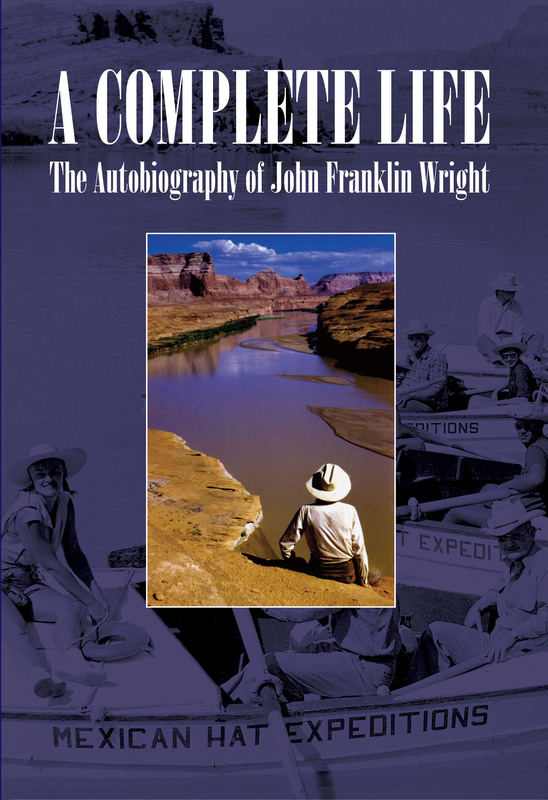 When Frank Wright died just short of his 100th birthday, he completed a full life lived mostly in southern Utah, from where he explored his surroundings in the sparsely populated area known for its archeological and natural resources. He was a jack of all trades, mostly selftaught, as a miner, driver, meteorologist, piano teacher, machinist, river runner, and photographer among others. This is how he saw his life in Blanding, in Grand Canyon, along the San Juan River, and on Lake Powell. “Seth Muller is a boots-on-the-ground, eyes-looking-deep poet. His Heart in the Bony Middle will best be read outdoors, one poem at a time, breath and being on the Earth in between. To know amazement at this Western Earth, and at your own existence, turn directly to the triptych of death poems that lead off Part II: The Plateau Beyond. Seth Muller has given us a collection not simply of words, but of reverence. 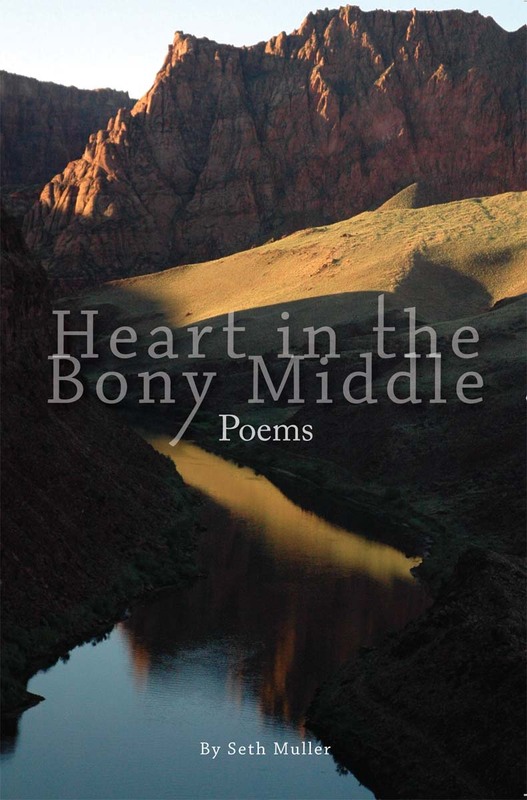 In Heart in the Bony Middle, Southwest journalist, author, playwright, and poet Seth Muller sets down forty poems unearthed from Grand Canyon, Zion, Bryce Canyon, and the surrounding landscape. The poems include meditations on such geologic phenomena as the Great Unconformity, the weathering of slickrock, and ancient fossilized footprints in the Coconino Sandstone. They also cross paths with ravens, coyotes, bighorn sheep, California condors, mules, and rattlesnakes. The words are crafted with heart, humility, and humor. They range from the unapologetically sentimental celebrations of canyon skies, temples, dusks, and dawns, to the folly of humanity against the significance of grandeur. Muller finds solace and comfort and, above all, truth and meaning in the chasm. What do rangers do? How do you get to be a ranger? The short answer: Everything and it isn’t easy. Chuck Luttrell thought he knew from watching his family friend, John Riffey, the longtime ranger on the North Rim of the Grand Canyon, going about his business every summer. But times have changed and so does a ranger during his or her career. 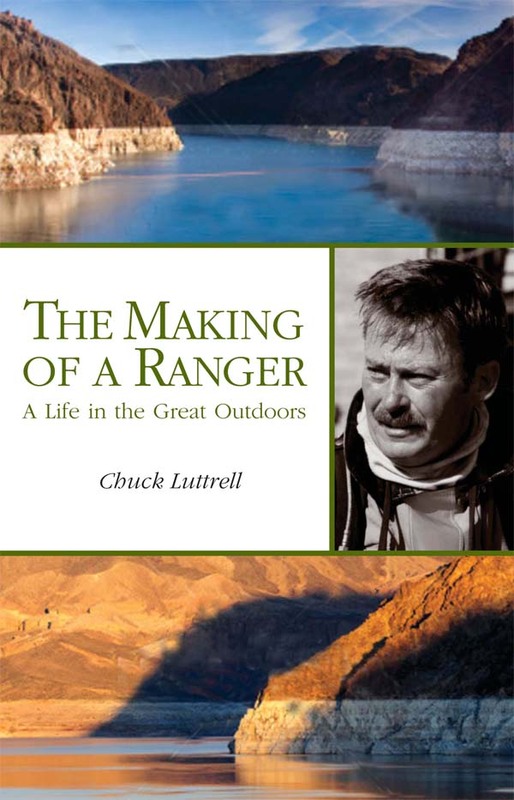 In The Making of a Ranger, Chuck chronicles his postings and the varied tasks he undertakes as law enforcer, fireman, medic, and rescuer whether on lakes, deserts, snow-covered mountains, or back roads. He acknowledges some successes and some failures which invites readers to wonder how they would cope with the various incidents he has faced. The conclusions he comes to about the rest of his Park Service career are not the ones he expected when he set out to master all the skills necessary to protect nature and the park visitors from each other and themselves. Chuck’s Park Service career took place mostly in parks with lakes such as Lake Meredith in Texas and Lake Mead NRA with some dry but hot assignments on the Shivwits plateau and Chaco Canyon’s Harmonic Convergence. 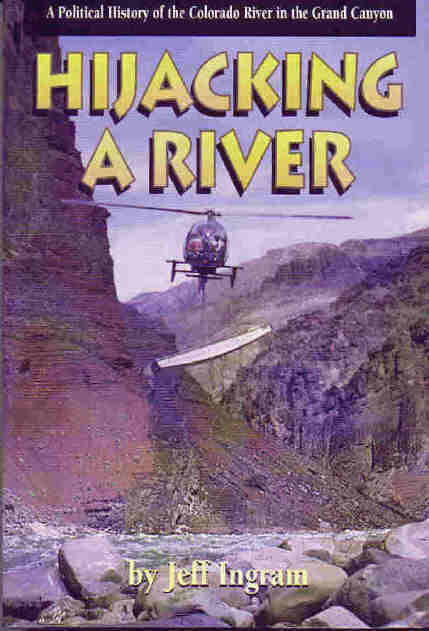 See Reviews There was a time when river runners built their own boats and rowed the Colorado River through Grand Canyon on free-flowing water; no permit problems, no high-tech gear and not much in the way of backup. What they did have were cameras, lots of film, cans of food, life jackets and journals to keep their notes in. Tom has chatted with a number of the guys and gals still standing, then scoured libraries, attics and garages to find the stories and pictures the others have left behind. He built a replica of Grand Canyon’s first decked McKenzie River dory from photographs, notes, and the original wreck the boat builder left behind, and has since rowed it through the Canyon three times. Here he tells the story of Moulty Fulmer, Brick Mortenson, P.T. Reilly, Dock Marston, and their friends on river trips on some of the highest water of the last century. He has included many stories of other trips during the same time period, the 1940s though the 1960s, including the development of recreational river running and boat design on the Colorado. Moulty Fulmer was bitten by the river running bug during a San Juan River trip in 1942. After a chance meeting with a McKenzie River dory builder, Fulmer constructed his first dory and rowed the San Juan in 1947. Traveling through Grand Canyon in 1948 on a Norm Nevills expedition, Fulmer met Colorado River historian, Otis “Dock” Marston, and they went on to run rivers together and correspond for the next thirty years. Fulmer built his second dory, the Gem, specifically for big water. Joining forces with Pat Reilly in 1954, they ran the Grand Canyon five times in home-built boats. Their adventures included rowing the wild Colorado River in 1957 on 126,000 cubic feet per second, one of the highest flows in the last century. Using historic photos, river logs, letters and interviews, author Tom Martin recounts the voyages of a number of unsung river runners during the transformation from Grand Canyon expeditionary river running into today’s whitewater recreation. 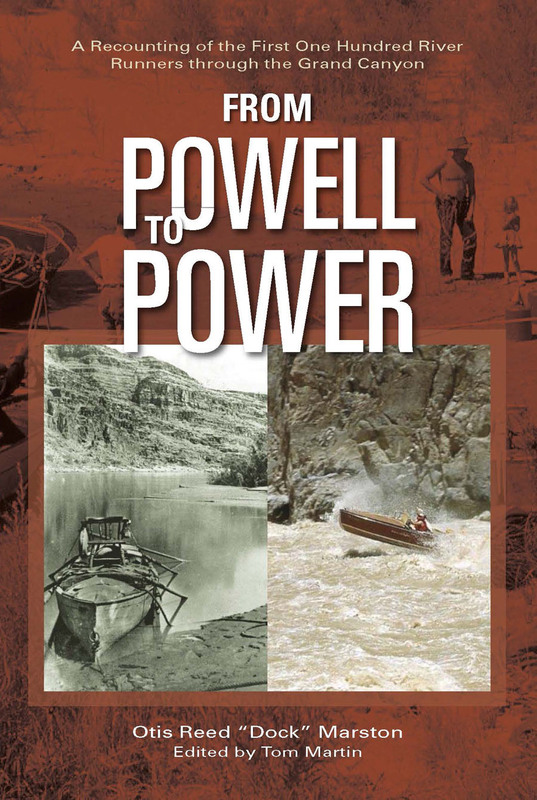 Big Water, Little Boats chronicles the start of the park’s river running permit system in 1955, the construction of Glen Canyon Dam, and the explosion of river running that occurred after the completion of the dam in 1963. We are currently offering you a second book for $6.05 to be shipped with your copy of Big Water, Little Boats. Click on whichever combo appeals to you - no need to click on Big Water, Little Boats if you're taking the second book too. Descriptions of these books can be found by scrolling down from here. SHIPPING IS FREE. As a Park Ranger, Nancy loved explaining the natural world to Park visitors so they could gain a deeper appreciation of their surroundings. In this, her first children's book, she explains the science behind the growth of a tree, in particular a Sequoia, with the aid of great illustrations by her cousin Robert. 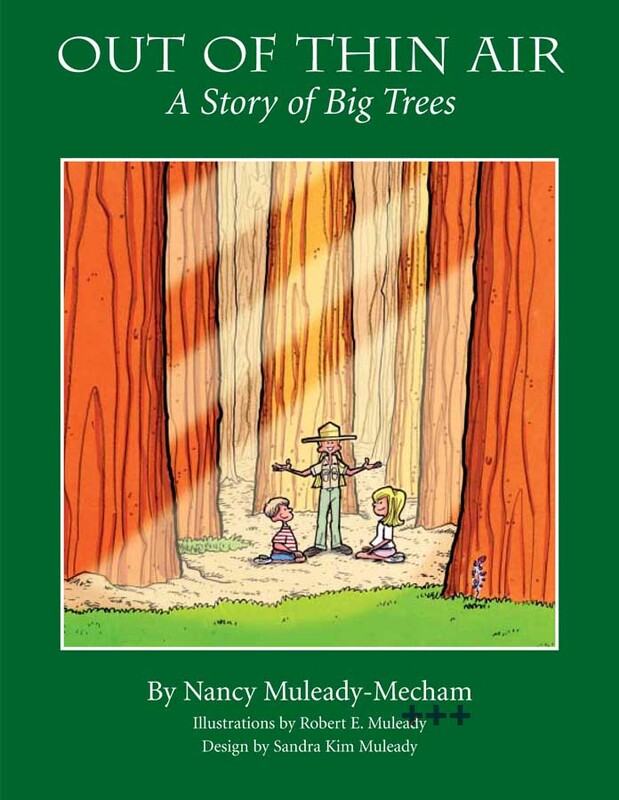 The book is aimed primarily at elementary and middle-schoolers with inquiring minds and would certainly help any parent trying to explain what makes a tree get so very big. Out of Thin Air is now out of print in its paper format but is available as an ebook with a great audio option. In this, Nancy's second collection of her real-life adventures as a Park Ranger and as a city medic, she tells of births, deaths, and life prolonged in between in her inimitable style. There's a great chapter on her training at FLETC, the federal law enforcement training school. She ventures further afield to Mt. Kilimanjaro (yes, we are aware it's not an American National Park, but it's a good story) and writes about a solo expedition she made more recently in the snowy wilds of California. If you've never ventured off a pavement trail or if you spend all your time in the wild, you can enjoy this book and learn a lot in the process. 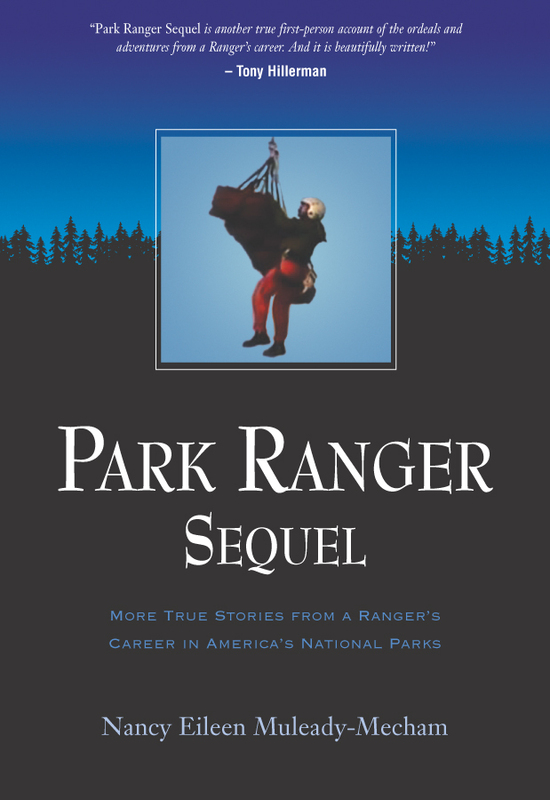 Scroll down through our catalog to find the first Park Ranger book. 5.5" x 8", 248 pages, softcover, 12 pages of color photos. 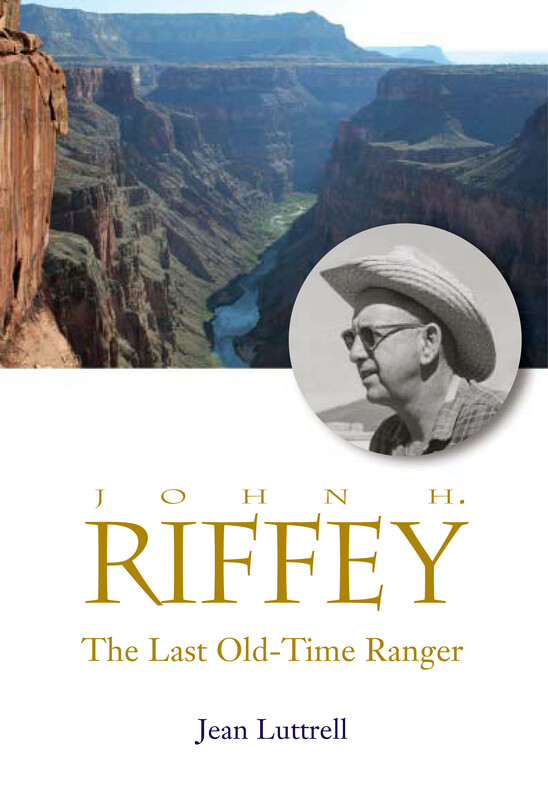 When John H. Riffey was assigned to the Tuweep Ranger Station on the North Rim of the Grand Canyon in 1942, his main task was to manage the grazing permits of homesteaders in Tuweep Valley who ran livestock in the then National Monument. Occasionally he was called on by the couple of dozen tourists a year looking for the Toroweap Overlook where they could gaze down on Lava Falls, hike up Vulcan’s Throne and enjoy the scenery and peace of a place eighty miles from a paved highway. By the time he died in 1980, the livestock were no longer allowed in Grand Canyon National Park, Riffey’s neighbors, the homesteaders, had left for greener pastures or were part-time residents, and there might be more than two dozen tourists a day barreling along the dirt road by his ranger station. He was still the only representative of the National Park Service there. His friends and acquaintances knew a man who watched out for his fellow men as well as protecting the high desert environment. He was always there to help, cajole or haul livestock, machinery and people out of the mud, snow, heat or water. This is his story told by the daughter of a neighboring homesteader who remembers Riffey’s arrival and departure and the decades of friendship and respect in between. 152 pages, 5.5" x 8", softcover, numerous black and white photographs. Boulder City, NV: Lake Mead V.C. San Juan Marina near Oljato in Monument Valley, Utah, was an isolated place in 1987 when the author and her husband arrived to manage the new marina on the San Juan River arm of Lake Powell. They fell in love with the surroundings and the Navajo people and culture they encountered. In addition to the daily joy and satisfaction of friendship and hard work, the couple dealt with floods and siltation, murder and drug-runners, and graft, greed and corruption. Note: It's impossible for modern river runners to float on down to the marina site at Paiute Farms. Below Clay Hills Crossing, there is the river-wide pourover, Fatt Falls, and the river/lake level has fallen so the water no longer flows near the bay in which the marina was located. 176 pages, 5.5" x 8", softcover, 4 pages of color photos. 0-9795055-0-X. 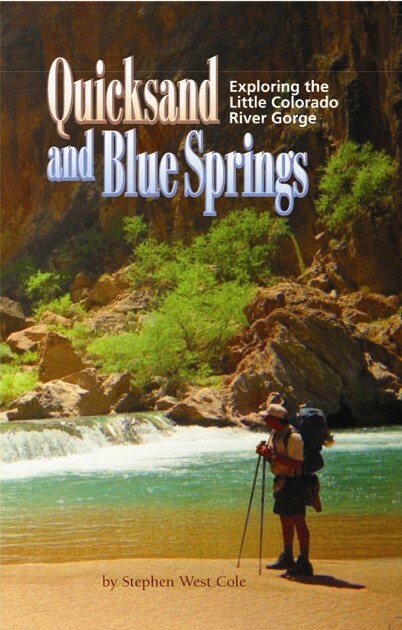 In May 2001, Stephen Cole and his brother hiked the Little Colorado River Gorge from the town of Cameron, Arizona to its confluence with the Colorado River, and out by way of the Beamer and Tanner trails in the Grand Canyon. He found the desert landscape so fascinating that he went back later to explore three remote side canyon routes which enter the chasm. There was very little written about the area then so here he shares some of his experiences and thoughts about it. The book is not meant to be a guide although we hope that anyone exploring the Gorge on foot or in an armchair will find it helpful. 176 pages, 5.5" x 8", softcover, 8 pages of color photos. 0-9674595-8-3. 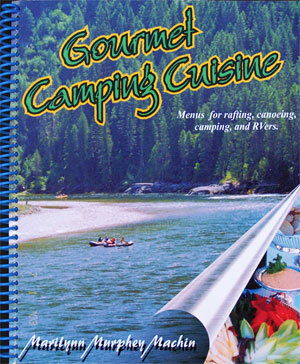 Gourmet Camping Cuisine not only has incredible food but is also a time saver and helper. It does not matter whether you are an expert or novice boater, camper, or RVer: we all like to eat well on our outdoor trips. This book was developed with rafting or canoeing trips in mind, but is suitable for any outdoor trip or in your own home. Want to do it like the pros? Read on. This book makes it easy for those of you who work and do not have time to organize or plan menus. Unlike other cookbooks, this book is not a simple listing of recipes. It has fully planned out menus. This includes multiple, complete breakfast, lunch, and dinner menus for trips of various lengths up to 18 days. It will give you step by step instructions on what to do at home and on your trip for each menu. These are more on the gourmet side for people who like to eat well. If you want hardtack, tuna glop, and beanie weenies, you’re out of luck. Delicious, well planned and prepared food seems always to bring out a festive mood in people, especially on river trips. And it also allows more time for hiking, reading, or just laying around camp enjoying the company of your friends or the scenery. 10" x 8", coil binding so that recipes lay flat. 224 text pages, plus many other pages with color photographs and cartoon illustrations. 30 complete Breakfast-Lunch-Dinner menus with 234 recipes. We doubt this picture will sell more books but at least you'll know whom to accost when you see them on a river near you. Hint, they may not be as clean and shiny then. Tom is on the right and Duwain on the left. The complete guide to floating through Desolation and Gray Canyons on the Green River in Utah. Sized at 10" x 14", this map book is printed on water-resistant paper specially made for all-weather use. The spiral binding and hard covers make them lay flat. They are printed with USGS 7.5' topographic maps as the background at the original mapscale of 2000 feet per inch. Additional information is added for river runners, including river mileage, campsites, rapids and other features of interest. ISBN 978-09913896-8-1 43 pages with 14 maps, 96 miles, all color photographs and shaded topographic relief. 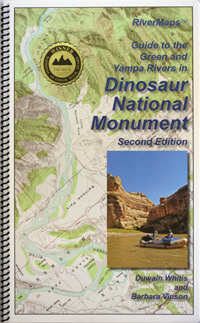 The complete guide to floating on the Green and Yampa Rivers in Dinosaur National Monument from Colorado into Utah. (This is the one with Lodore Canyon in it.) Sized at 10" x 14", this guide book is printed on water-resistant paper specially made for all-weather use. The spiral binding and hard covers make them lay flat. They are printed with USGS 7.5' topographic maps as the background at the original mapscale of 2000 feet per inch. Additional information is added for river runners, including river mileage, campsites, rapids and other features of interest. See Reviews Scott Baxter is a climber, hiker and lover of the Southwest deserts and mountains. He is also a poet who expresses his appreciation of nature and his interaction with it in his words. This is a collection of poems from his first two books, Where All Suns Enter and Rock in Bodies, together with new poems. 5" x 8", 80 pages, 0-9674595-7-5. 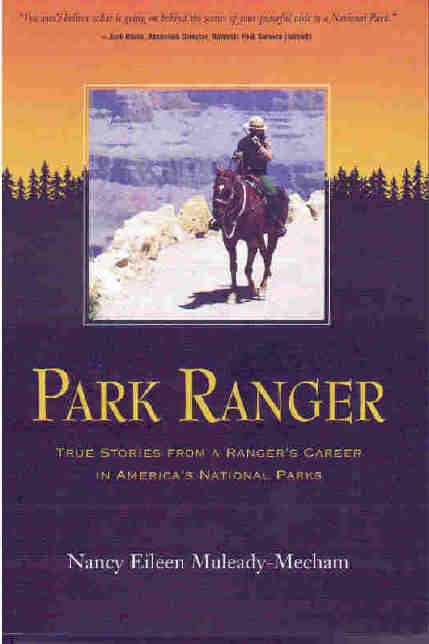 See Reviews What does it take to be a Park Ranger? Stamina, calmness, a sense of humor and training in as many fields as possible judging by these stories from Nancy Muleady-Mecham's twenty-year career as a ranger in several parks around the country. Her first assignments were in Sequoia and Kings Canyon. Some were just one season in places such as Pearl Harbor in Hawaii and others longer such as her many years at the Grand Canyon. She tells us about the different skills she learned and how she used them to save lives, retrieve situations from the brink of disaster and deal with whatever came her way. She also describes some of the sublime benefits of living and working in a National Park. 5.5" x 8", 244 pages, softcover, 8 pages of color photos. See Reviews Ever wonder why it takes years to get a permit for your own Grand Canyon trip? Jeff Ingram, fresh from the battle over the Grand Canyon Dams in the 1960s, turned his attention to gaining wilderness protection for the Grand Canyon. The 1964 Wilderness Act had been passed not long before and the Grand Canyon including the Colorado River had become "potential" wilderness. This book describes how the river became the sticking point and all that has been done over the last 30+ years to make the definition happen - and to stop it happening. Using source materials from various libraries, depositories and interviews, Jeff tells the story from his vantage point as a participant on the side of wilderness. The river runners, both self-guided and commercial, the Park Service and other government officials, politicians and environmentalists all played their parts in pushing, pulling, slowing, speeding up, articulating and obfuscating the issues. There's a wealth of detail here and, with the Colorado River Management Plan in progress again, even a quick skim of the book will help you recognize the circle we're all trudging round again. Read it and react! 6" x 9", 496 pages includes maps, index, source notes. 0-9674595-3-2. 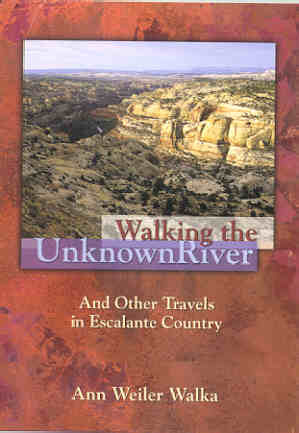 John Wesley Powell's men called the Escalante River the "Unknown River." It was the last river to be charted on the maps of the U.S. lower 48 states and it still remains quite remote today. 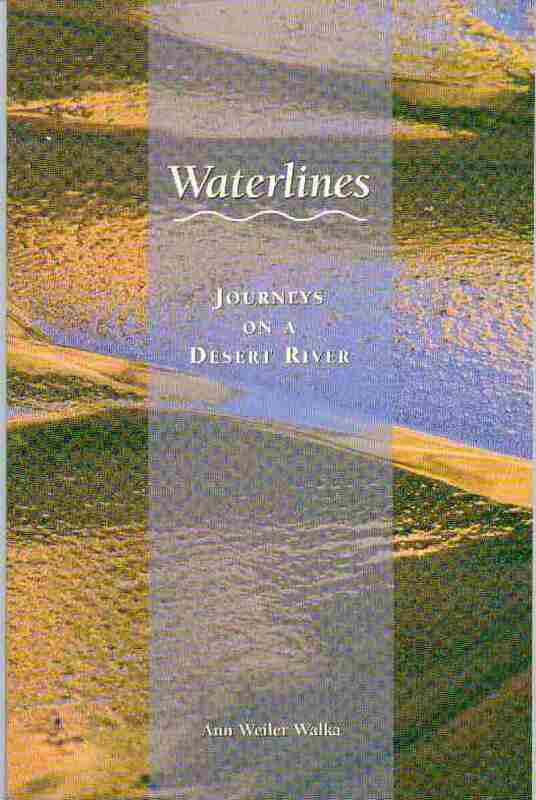 The author recalls a wild and lovely place partially drowned by Lake Powell.Ann's essays and poems evoke the solitude, beauty and harshness of the remote country along the Escalante River in southern Utah. Her many travels through the country allow her to relax into it and let is speak through her. Ann Walka is a naturalist, museum trip-guide and poet. She introduced President Clinton at the ceremony to announce the creation of the Grand Staircase-Escalante National Monument. Soft cover 103 pages. Ann Weiler Walka has created a map of the heart through her poetry and it is beautifully contained in Waterlines. 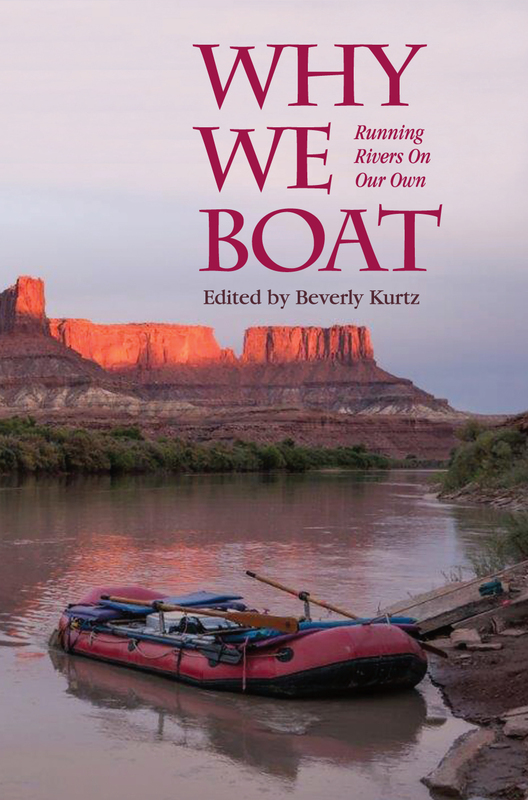 For travelers of the Colorado Plateau and particularly those choosing to immerse themselves in the San Juan River, this collection is a trustworthy and evocative guide written and lived by a woman who understands the desert as an oasis for our spirits. Soft cover, 5.5" x 8", 64 pages, 0-8845460-3-X. See Reviews Aimed at river runners who want to get the most hiking out of their river trip, these hikes may take an hour or be from sunrise to sunset. Useful for planning your itinerary and for stuffing in your fanny pack. Backpackers who can read backwards (from the canyon bottom actually) will appreciate it too. Forget the next rapid, look up! The maps are improved and the text updated. There are now eight pages of photographs in the middle. We are currently offering you a second book for $6 to be shipped with your copy of Day Hikes. AND FREE SHIPPING Click on whichever combo appeals to you - no need to click on Day Hikes if you're taking the second book too. Descriptions of these books can be found by scrolling up from here. See Reviews & Awards Do you want a Grand Canyon guidebook written by boaters for boaters? Tom Martin, author of Day Hikes from the River, and Duwain Whitis, publisher of RiverMaps map books, have teamed up to write a guidebook. 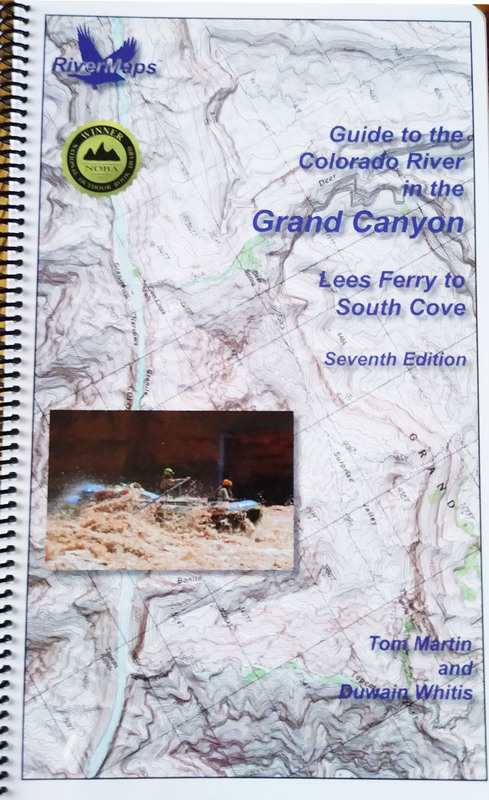 This is the only guidebook to the Canyon with USGS topographic map backgrounds printed at their original scale, with additional details in an easy-to-read format. It is also the only guide with maps extending to South Cove in Lake Mead. Each map shows campsite locations, rapids, scout points, river miles and other points of interest. The accompanying text describes all campsites on the park inventory (and some extras), with campsite pull-in information, geological, botanical and historical points of interest. Maps and photos are in color. The guide is 8.5" x 14" spiral-bound to lay flat. The seventh edition reflects the changes to access to camps on Hualapai land as well as regular updates to camps and rapids. The broadside was printed on a 19th century letterpress by Littoral Press in Oakland, CA, from handset metal type and handmade St. Armand paper, in a limited edition of 150. The artwork is by Sharon Dolan of Higginsville, Missouri. It comes in three colors, Coconino yellow, Bright Angel red and Tapeats brown. 978-0-9905270-2-2, perfectbound trade paperback, 532 pages, December 2014, $30.00. 978-0-9905270-3-9, hardback with dustjacket, 532 pages, December 2014, $35.00, no longer available, sold out. We also accept credit card orders over the phone.